Despite there being no hard and fast rules about what to eat on Christmas day in Italy, the evening meal on the Vigilia (Christmas Eve) will generally follow the Catholic tradition of being meat-free, so fish and fresh seasonal produce take center stage. In Rome, the big family dinner on the 24th will, more often than not, kick-off with this fritto misto: battered, deep-fried vegetables. 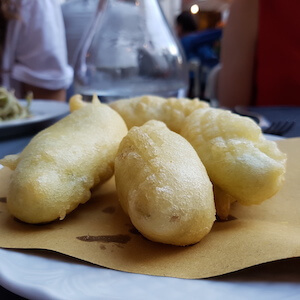 Although many shops and delicatessens sell ready-made fritto, to ensure that the batter is crisp, crunchy, and hot why not make it yourself? You can use whatever vegetables you fancy, just make sure that everything is cut to a similar size. Chop zucchini and carrots into batons, clean and quarter some small artichokes, divide broccoli or cauliflower into florets, and slice potatoes and eggplant into rounds. For a really Roman touch, try also adding a few pieces of apple or pear. Fry the pieces in batches until they are golden, sprinkle with salt, and serve while piping hot for a perfectly delicious way to begin the holiday festivities. Prep the vegetables and set aside. Pour the frying oil into a large, wide saucepan and bring to boiling (about 170°C/338°F). Make the batter by placing the flour into a bowl with a generous pinch of salt. Add the olive oil and then gradually pour in the water or beer while continuing to whisk the mixture in order to avoid any lumps. Keep mixing until the batter is thick and creamy (it should be thick enough to stick to the back of a metal spoon). Once the batter is the correct consistency, check that the vegetable oil is hot enough to start frying by dropping a teaspoon of batter into the pan. The exterior should bubble and the mixture will turn golden. Put two or three ice cubes into the batter to keep it cool while coating and frying the vegetables, stir the mixture occasionally, and carry on adding more ice cubes if necessary. Take each individual piece of vegetable, coat it in the batter, and carefully lower it into the boiling oil. Be careful not to overcrowd the pan, so continue to fry in batches. Each piece should take around 3-4 minutes to cook. Once it is golden brown and the edges are crispy it is ready, so remove from the oil and place on absorbent kitchen paper to drain off the excess oil. Sprinkle the crispy battered vegetables with salt and serve while still hot. If you are in Rome over the holidays, don’t miss our special edition tour that runs only for one month a year, the Christmas Food Walking Tour in Rome. And check out our foodie blog for tips on what to eat, where to shop, and what to cook at Christmas time in Rome! Try this delicious recipe for a traditional Roman Christmas Eve recipe, fritto misto. Cook Italian-style deep-fried battered vegetables and celebrate Christmas the Italian way.